Happy New Year and lets make our New Year resolution to help others achieve the same enjoyment we get from using CW. I have had good news from Tom EI5CA about the Morse Class he started late last year and he has ended up with 5 students dedicated to learning Morse. Well Done Tom and hope you will share your experience with us. I am giving a presentation using Microsoft Power Point at my own club in February which will then be the start of a club Morse Training Group for all levels of CW, I seem to have plenty of interest at the moment for it. If anyone wants my Power Point presentation I will put a download on this site once I have polished it up. I would like to hear from anyone else starting teaching Morse and how it worked out for them so either comment on this post or send me a message. 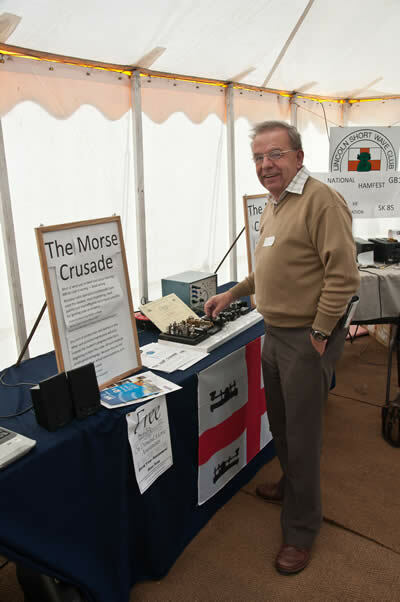 The Morse Crusade stand at the National Hamfest 2011 was a complete success with over 50 visitors signing the Guest Book. I apologise for not being at the stand all the time, but I was also taking the Morse assessments, next year I will be having more help so their should always be somebody on the stand. Eight Morse assessments with three passes, it looks bad but four assessments were for 30wpm and the candidates could not write it down even though they could take in in their heads. I have told them to learn to touch type and next year will have a proper keyboard for them to use so I hope their will be more success at higher speeds next year. When I started the Morse Crusade I knew I had to let it evolve because I was blinkered by being trained professionally using the Koch Method and wanted the opinion of others so that the website could evolve with an open mind. I though that The Morse Crusade was going to be controversial like Darwin’s publication “The Natural Evolution of the Species” and it was going to be difficult to convince others about the pitfalls which can happen in learning Morse Code, however I have been proved wrong and very pleased with the positive comments I have had from everyone, so a big THANK YOU to everyone who has contributed to the Morse Crusade. I received the message below today and thought that I need to put a “Guidance” section on this website. Before receiving this, I was going to point to other websites for information, but although there was good information out there, it was not complete. I am pleased to announce the the Fists CW Club, The International Morse Preservation Society, are helping the Morse Crusade by featuring the Morse Crusade on their Latest News bulletin on their website and have also added a link to the Morse Crusade in their Links section on their website. Thank you Fists for your help.